I just discovered these little fellows in my backyard. The idea of having a cat as a pet has never been seriously considered by me. As a little boy, I thought only girls had cats while dogs were for boys. But these kittens are cute. Setting my pride aside, I have to admit that I probably spent 15 minutes watching them play and scamper around. 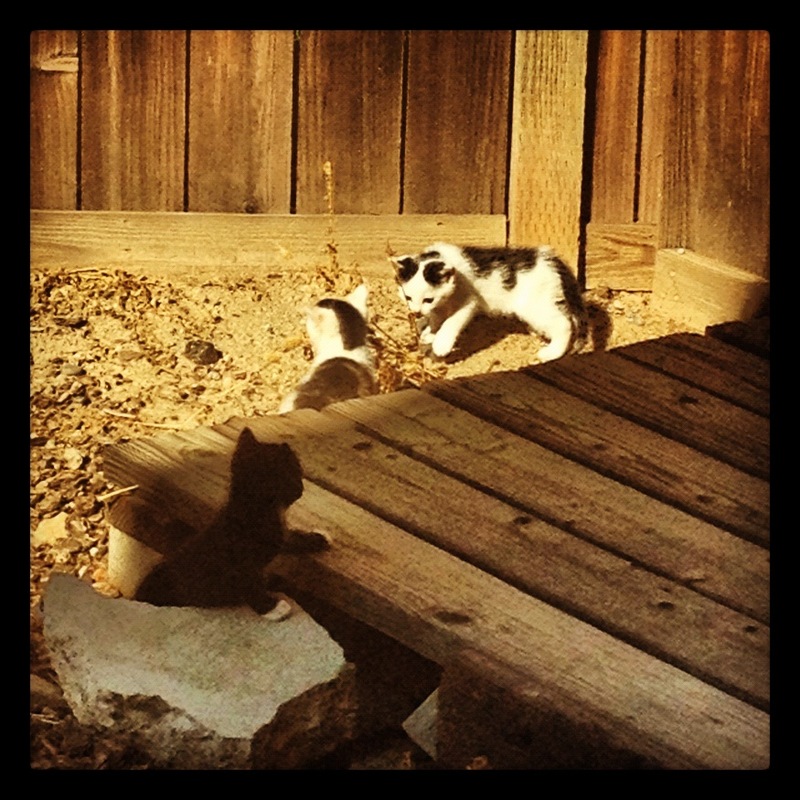 Oddly enough, the idea of keeping these kittens around has entered my head. It’s definitely a foreign idea and one that I will have to seriously consider. I’m hardly home, spending almost all my time at work or college. And I’m not sure I want cats around. Plus think about it. Single guys don’t typically have cats for pets. Cats are for the sweet older ladies that I see at my local Stater Bros. But it would be kinda nice to have a pet around for company. Animals aren’t like people. And cats aren’t like most animals. I think of cats as being cold and calculating, a little like me. So maybe these kittens would sync right into my life. If I do end up “adopting” these kittens, then I of course I need to name them as well. Triplet names that immediately come to mind would either be after the Three Stooges, the Three Musketeers, or the Three Wise Men. Obviously there is a problem with my naming process. My friends have been pushing me to get a pet now that I have a house with a large backyard. But I’ve been stubborn so far. It’s quite possible that these kittens are the solution to my pet-less existence. So should I keep them? Yes or no?